In Working The Boxes we highlight any recent back issue purchases we've found buried in comic boxes or discovered on eBay that we think are worthy of further attention. Jo S: Linking to the imminent release of Guardians Of The Galaxy Vol. 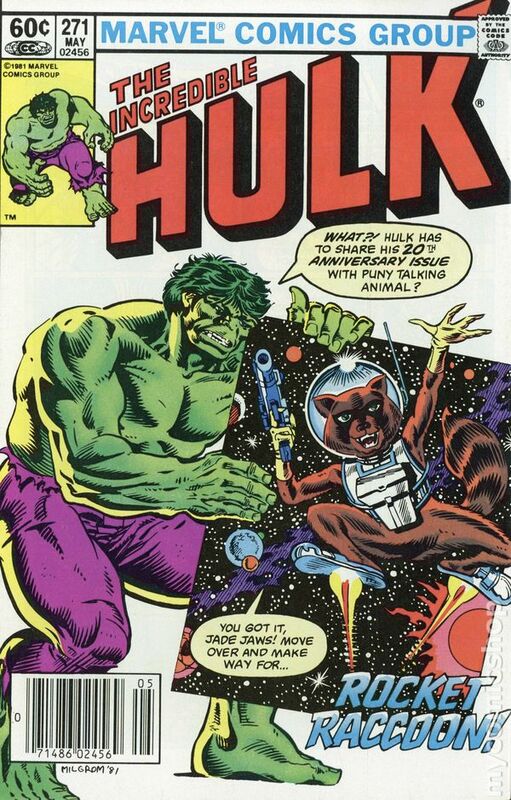 2, it feels like a good time to dig out a couple of issues which showcase the origins of my favourite wisecracking fuzzball space pilot, the irascible Rocket Raccoon. Whilst the Guardians in their current form are a fairly recent entity, Rocket himself has been around since a year when my most vivid memory was spending a productive afternoon filling ice cream tubs with mud to find that the sweltering drought had turned them into bricks overnight. 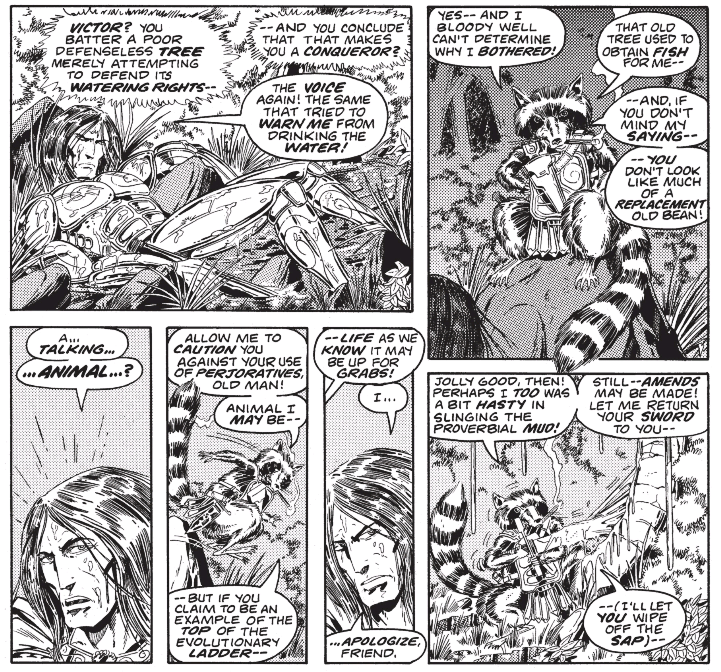 Older than a good number of the PCG, Rocket Raccoon first sauntered onto the pages of Marvel Preview #7 in the sweltering drought summer of 1976, swearing mildly and smoking a cigarette in classy detailed monochrome; suavely putting down the hero of the tale, Prince Wayfinder. The prince has landed on the mysterious Witch World, planet Hailailae, and is totally unprepared to meet animate trees which fight back and sassy rodents who backchat and refer to him as ‘old bean’. The ‘Sword in the Star’ is the back-up story following a tale of Satana, which now appears only to be available on eBay for something in the area of $700; a little chasing around located just the back-up story for a much more reasonable sum but my source for this, and for the second issue mentioned here, was a collected volume of six issues: Rocket’s first two guest appearances, plus a four-part series which was his debut as a title character. 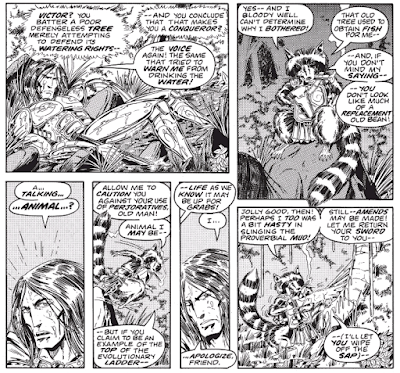 Rocket’s style in this first black and white issue is evident in his modern rendering: Keith Giffen’s detailed art gives him a wide, distinctly furry face with beady eyes and Bill Mantlo sets up his wisecracking humour - although he does read as distinctly upper class British to me in this version. Move ahead five summers (no more ice cream brick-making for me, I'm now a spotty bespectacled nerd at boarding school, my abuse of mathematics as a refuge from real life starting to kick in) and Rocket makes his first appearance with an origin which starts to feel a little more familiar. It's not quite his own story yet but he shares the front cover of Hulk #271 with the big green guy on his 20th anniversary issue, and can't seem to resist insulting him with the first of a series of ‘oh look, he’s green’ quips. Now in colour, Rocket is a little more round faced and has more human eyes, which I think render him a little less lifelike, but now he has rocket skates! These look like an accident waiting to happen, for me, but hey, I'm a parent now, I see dangers everywhere! Rocket is established as a spaceship pilot hailing from Halfworld in the walled-in Keystone Quadrant, a planet so named because half its surface is scoured of life and turned over to the seemingly eternal building of a giant ship carried out by automata, whilst the other half is home to talking animals and a group of humans known as the Loonies. 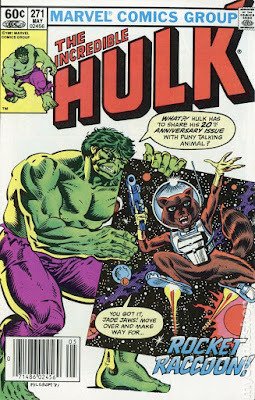 In this issue, Rocket and his co-pilot Wal Russ (can you guess what kind of animal he is, kids?) discover an unconscious Hulk lying in the pink, pink grass of home, just as he is about to be quite literally mown down by an overly efficient robomower. A tale ensues of evil power hungry moles, wise but treacherous turtles, deadly killer clowns and brigades of murderous rabbits, garnished liberally with green jokes and coloured in dazzling bubblegum shades. Rocket shows off his skills with specialist weaponry and we start to see his tactical and team-working talents appearing. From Guardian of the Keystone Quadrant to Guardian of the Galaxy? All in a day’s work for this little bandit (if those rocket skates don't land him in A&E first).